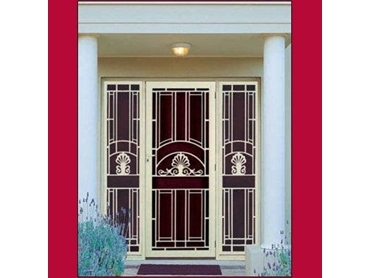 Cannon Security Fabrications makes available the steel security doors from Steel Guard Security to protect and enhance any home. Customers have the option of working with designers to customise their own or choose from a comprehensive range of standard security doors. These doors are hot-dip galvanised with optional Powder Coating to the colour of choice (selected from the Dulux Powdercoating colour range). Hot-dip galvanising ensures a high level of protection as the Zinc coating is stronger and more durable than other methods. The molten zinc bonds to the steel surface to achieve comprehensive coverage of potential corrosion areas such as corners, edges and joins. There is also the additional choice of steel bars (square, round, or flat) and optional fly screen or privacy mesh.